No, not a rattlesnake. I just look like one. I'm a gopher snake. One day an oily, filthy, fleshy human child crossed my path. As luck would have it, he knew the difference between a gopher snake and a rattlesnake. He has imprisoned me in a terrarium. His name is Gunnar. He calls me Crusher. He thinks I'm male. I'm not. He dropped in a dead mouse and hoped I'd eat it. I buried it. He then dropped in a live one, which he called "Breakfast." I didn't lay a coil on it. Gunnar thinks I'll be his adoring pet. He's wrong. In fact, I am planning my escape. I may take Breakfast with me. Crusher will charm readers in this entertaining, clever novel about a snake in captivity and how she turns the tables on her human captor. Patrick Jennings grew up in a small town in Indiana, where there were no wild, lethally venomous snakes. His family then moved to rural Arizona, where lived many, including seventeen varieties of rattlesnake. Patrick got seriously freaked out. He now lives on the Olympic Peninsula, where there are scarcely any wild, lethally venomous snakes. 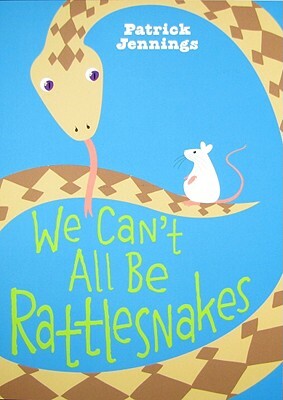 We Can't All Be Rattlesnakes is his fourteenth book for young readers.